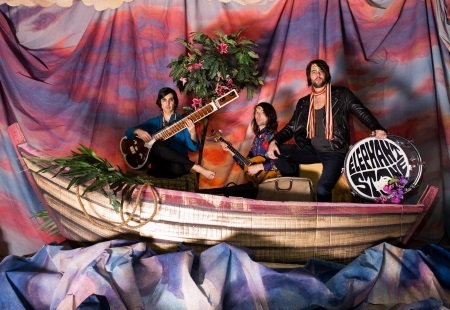 Like their Australian counterparts Tame Impala, Canadian psychedelic raga rock trio Elephant Stone have added a bit of dance to their sound on their new full-length Ship of Fools. Band leader Rishi Dhir plays more keyboards, but long time fans don't need to worry; his signature sitar is still at large. They don't shun big themes - Manipulator is a fierce statement about an unnamed dictator, but their lyrics work best with less ambitious themes. Relationships coming to a messy end is a favorite (Silence Can Say So Much, Photograph). And of course psychedelic rock's pet subject outer space comes to the fore as well in Andromeda and Au Gallis. The dark and brooding The Devil's Shelter, with guest vocalist Alex Maas of Austin, TX, band The Black Angels is the stand-out track, a blend of Indian rhythms, dense electronics and Floydian washes of guitar. The sole clunker is Love Is Like a Spinning Wheel, a sappy ballad that comes close to boy band fodder. Elephant Stone have found their niche, but by incorporating new elements and influences into their sound they keep it fresh and interesting. Ship of Fools is a self-released album. Pre-order (vinyl, CD, cassette, digital) from their website. A free four track sampler, Little Ship of Fools, is available for free thru NoiseTrade. HCTF review of The Three Poisons.